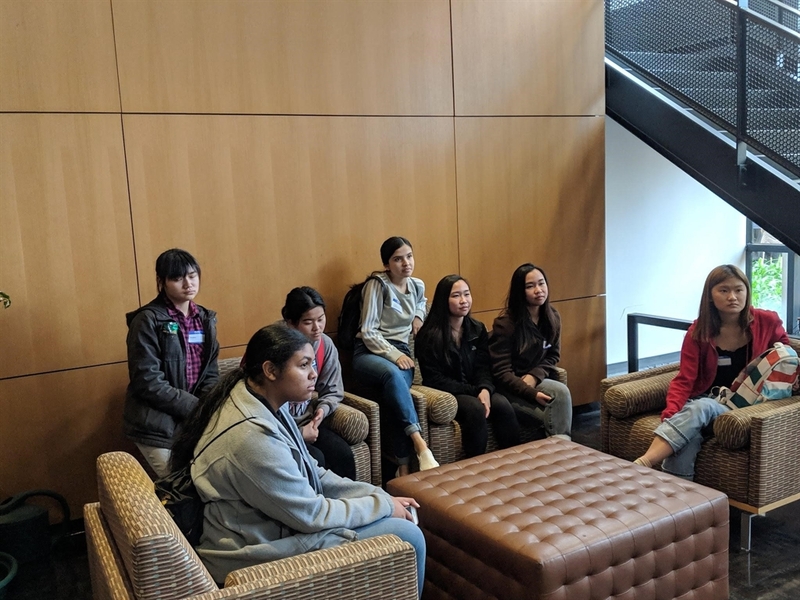 On April 12, 2019, ViewPoint Therapeutics hosted a small group of five high school students from Capuchino High School. The students were referred by their science teachers as being highly interested and talented in different aspects of science. The event started with a lunch and a series of introductions and Q&As about ViewPoint’s research. Then, the students spent about two and a half hours in the ViewPoint lab facility, dissecting a bovine eye, rabbit eye, and porcine heart. Each student was able to dissect her own tissue with guidance from volunteers at ViewPoint and YWIB. Students identified various parts within the ocular anatomy and compared the sizes of different structures between the rabbit and the bovine eye, and further discussed the differences in visual requirements for each species. Next, students learned how to dissect the porcine heart, identifying the ventricles, atria, valves, and the major artery and vein. The event concluded with an orientation and tour and of ViewPoint’s laboratory facility, where the students learned about the different pieces of equipment and how they are used to conduct research. 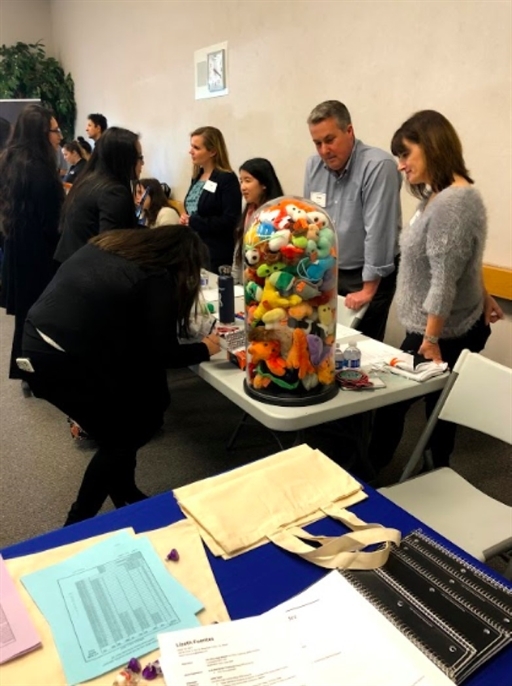 On Jan 30, 2019, Mountain View and Los Altos High School held their annual mock career fair for around 150 junior and senior students in the AVID (Advancement Via Individual Development) program. Three volunteers representing Women In Bio participated in the event. The AVID program aims to serve highly motivated, under-resourced students, many of whom are immigrants or would be the first generation in their families to go to college. The program provides exposure to students, who don't have the means otherwise, to see the scope and variety of diversity, skill sets, educational pathways and mindsets needed for today's jobs. Prior to the event, the students learned how to prepare resumes and research the companies with help from the teachers. At the career fair, the students were expected to act professional, present their interests and goals, as well as ask the recruiters relevant questions, just like a real career fair. The volunteers, in turn, acted as recruiters and gave students feedback on their resume and advice on their goals. The students were then introduced to various types of jobs from ten different organizations, including biotech jobs represented by WIB volunteers. The professionals were impressed by the students’ accomplishment, enthusiasm, and dedication to their goals. The event was a great success that helped the students to practice talking to professionals and prepare for future interviews. On March 20th 2019, fifteen 10th grade students from June Jordan High School visited Amgen to learn about careers in biotechnology. June Jordan is a small underserved public high school in San Francisco with a high percentage of minority students. 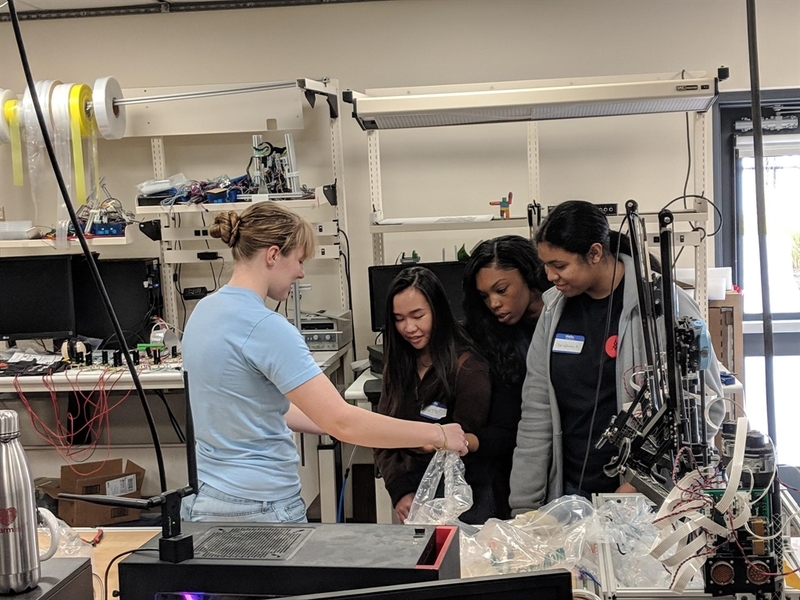 Young Women In Bio (SF) has been making an effort to reach more underserved students and this event was a perfect opportunity to connect the local community to the booming biotech industry in their backyard. The students had not visited any companies before, and the amazing volunteers with Amgen’s WE2 organized a fun and informative event to introduce the students to STEM careers. The event kicked off with an introduction to biotechnology and Amgen. The presenting volunteer also talked about her own journey from school to industry, and her transition from science to business development, showcasing the possibilities in the STEM field. Another scientist introduced the concept of diffusion and osmosis in a lively presentation. Then the students observed plant cells under microscopes and watched the live cells change shapes through osmosis. Next the students toured the offices and labs, observed fluorescent cells on a high content imaging microscope, and they even got to practice using different pipets like real scientists! Finally, the students sat down to have lunch and continued to chat with the professionals. We are very excited to connect with the students who normally have few opportunities like this and show them how diverse and interesting STEM careers can be. Despite not having a deep background in biology, the students were engaged and the activities sparked their interest. We thank the Amgen volunteers for planning such a wonderful event, CLSI for connecting YWIB with the schools, and the June Jordan teachers for making the event possible! WIB-San Francisco hosted a networking event at Nurix in celebration of women's history month and was attended by over 40 women from across the bay area. Nurix works on the development of cancer therapeutics. Our hosts at Nurix offered some valuable tips on networking and engaged the audience in sharing their networking experiences. The event was a great success with participants walking away with new connections and friends! 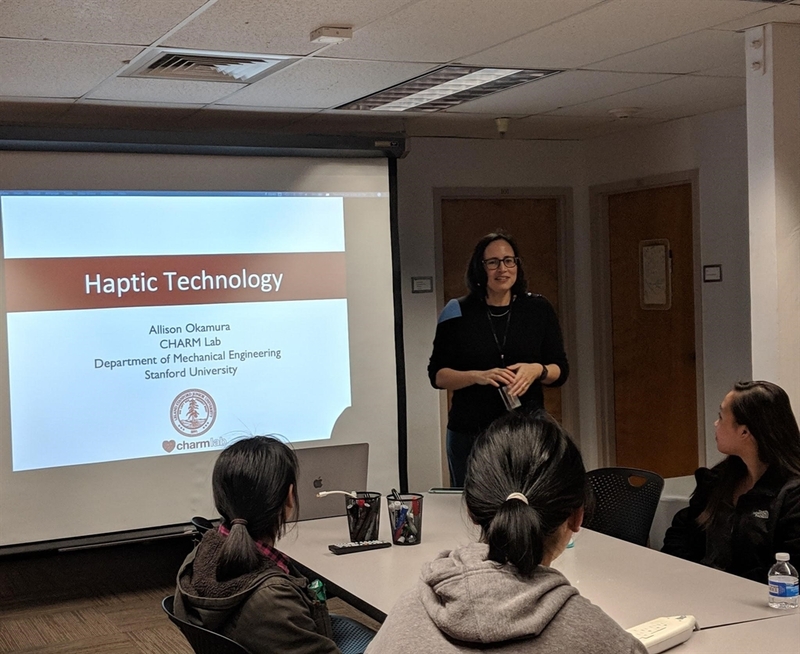 On February 28, 2019, the Collaborative Haptics and Robotics in Medicine (CHARM) at Stanford University hosted a group of eight high school girls, presenting on the Science of Touch (haptics). The afternoon consisted of a presentation and several demonstrations showing how robots can be used to study touch in a virtual environment and the ways in which haptics can be applied in a real-world setting. To kick off the event, the director of CHARM, Professor Allison Okamura, shared her educational background and how she came to work in robotics. She then turned over the presentation to two PhD students, both of whom are studying soft robotics. They spoke about what we can learn from nature to improve the way in which we interact with our environment. They also spoke about how design thinking (empathize, define, ideate, prototype, and test) and iterative design is implemented to improve their research. The PhD students had the high school students consider how haptics could improve learning retention in a similar to how combining seeing, speaking, and hearing improves learning retention. - Surgical robotics to assist physicians. 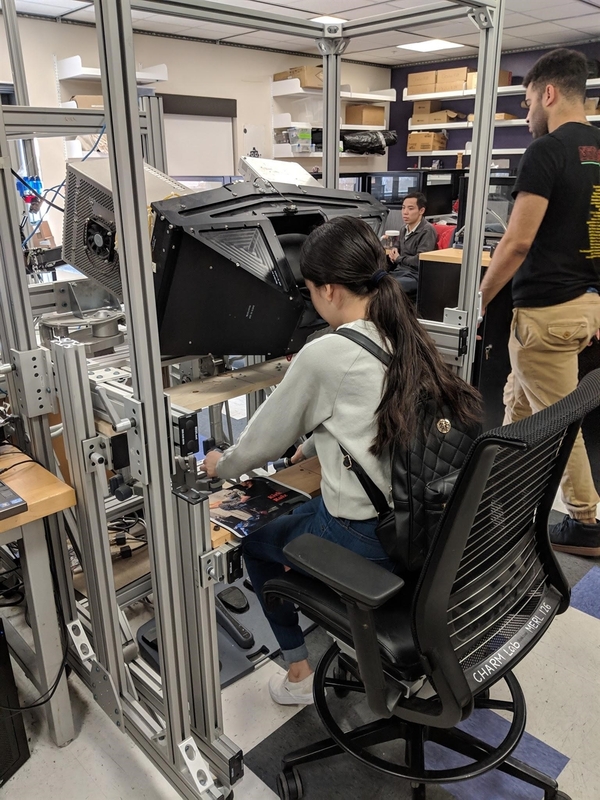 Similar to the da Vinci Surgical System, the graduate student demonstrated how robots can assist physicians in surgery, making procedures less invasive. Specifically, these devices can be used in prostate and breast cancer. The girls were each given the opportunity to test the machine. - Rehabilitation robotics to assist patients in moving following a brain injury. This particular student was researching how to improve movement following death of brain tissue due to a stroke. He explained how the brain controls the body through proprioception, and how we process where our body is in space. Through his research, we may be able to better understand errors in proprioception that occur following a stroke, and how we can help patients overcome the damage. - Soft robotics through a bioinspired vine robot. In nature, animals are made of soft, flexible tissue while most/all of our robots are constructed on hard, rigid material. Using bio-inspiration, it is possible model robots to function better in our natural environment, have a certain degree of motion, and achieve new things. The graduate student shared a few examples of her research, including robots made of plastics and silicon and coffee grounds. - Haptics in virtual reality. Currently we have the ability to interact with robots through a stylus, but by developing wearable haptic robots, we can reach into the world and experience touch. The graduate student shared her research which included a wearable device that can help use to better understand skin stretch, muscle stiffness, and how we think about texture. - Soft actuators to support special orientation. Using a wearable device outfitted with a motor, it is possible to communicate direction with people. Potential uses for this wearable device include guidance for people who are blind. The graduate student noted that people can detect change as low as 30 degrees. Following the hands-on demonstrations, three female PhD students were available for questions and answers. Each discussed how they became interested in engineering, and their path to Stanford, noting that a big driver was wanting to help people by building things. They emphasized that while your degree may influence what you do in the future, especially if you are interested in a technical field, where you go is not as important. Attending a school that is an appropriate size fit, and where you can have a greater impact by getting involved in classes and clubs, may be more important for your success than choosing a school simply based on name recognition. The PhD students urged the high school students to keep an open mind about what they want do in the future. There is a lot to learn and many experiences to have in college that may help direct their future. A final point was to remember that everyone has something to bring to the table. It is key to focus on your strengths, whether that be creativity, communication, analytics, rather than focus on weaknesses. The teams that are successful are those that have a wide variety of people, each of whom brings a different skill set to the table. The high school students found the event stimulating, and challenging, but in a positive way. The best part of the day was the hands-on demonstrations and the students noted they would have liked more hands-on activities and more time in the lab. They also would have liked more time speaking with graduate students about their experiences. Nearly all said that they would recommend future YWIB events to their friends, and would absolutely come to another event. Additional photos from the event can be found here. 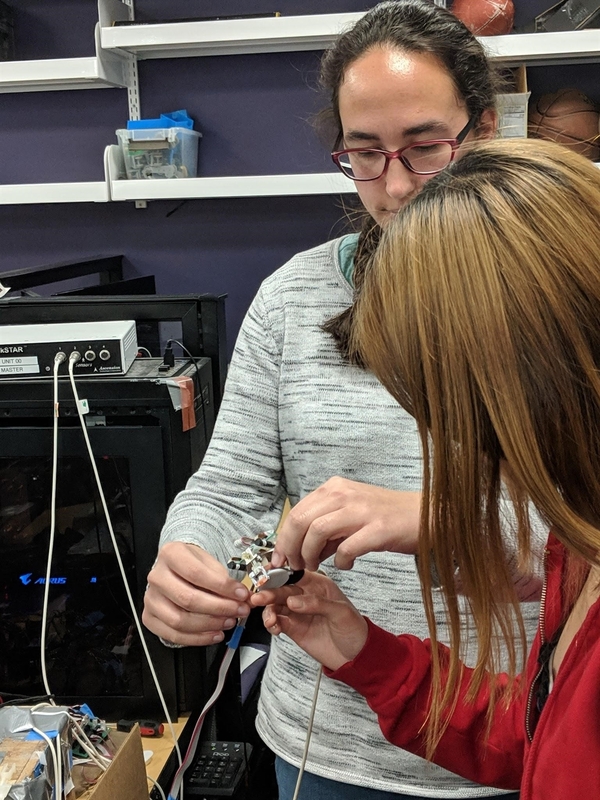 Young Women In Bio - San Francisco Bay Area has partnered with College Track Oakland and San Francisco to bring STEM experiences to young women. 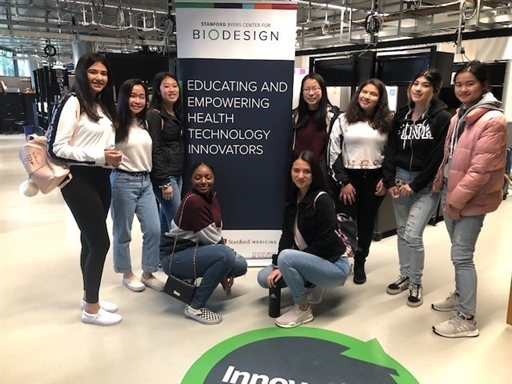 On February 6, 2019, Young Women In Bio and College Track visited the Stanford Byers Center for BioDesign.The focus of this program was to learn about the intersection of health, technology and innovation with seventeen highschool girls in attendance. The event began with an overview of the BioDesign fellowship program and a tour of the facilities by the Manager of Academic Projects & Communications, Stacey Paris McCutcheon. Stacey explained to the students the three stages of innovation that the fellows learn in the program: 1) how to Identify a problem, 2) Invent a solution, and 3) Implement the invention in the healthcare field. During her tour, Stacey presented the students with inventions that had resulted from the Stanford BioDesign program. The students were then joined by four female fellows: Delphine Huang, MD, Shira Koss, MD, Melissa Morgan, MD, and Ashley Seehusen, PhD in the Stanford BioDesign program. Each of the fellows had followed a different path from physicians to marketing experts and shared their academic and career history, why they joined the program and what are their biggest learnings to date. The students were given time to ask the panel of fellows questions about what problems they are working on solving and what they think they will do after the program.